Delicious food and interesting information. Also great walking tour through Stockholm. Our guide Soma was really great. Figuring out where to meet up was a little confusing, but the food and tour guide were both excellent. A little pricey, yes, but so is everything in Stockholm. Our food tour with Dara as our guide was amazing! The food was a delicious variety of quality food. The tour of the city along with the food choices was well worth it! An absolute must when in Stockholm. Tasty, interesting and fullfilling in every sense. This tour was just fantastic! 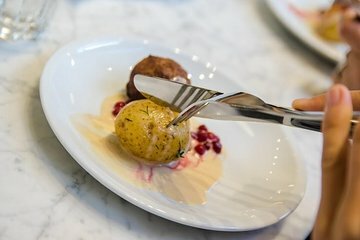 A great variety of food stops along the way while walking through Stockholm and learning the history. Our English speaking tour guide Soma was second to none. She was knowledgeable and a food enthusiast! My only regret is that I didn't purchase more of the salty licorice at the licorice shop. It is fantastic. Don't hesitate to book this tour for a great way to learn about Stockholm and sample some fantastic food. It was decent, but could have done it on our own. Definitely the highlight of my time in Stockholm! There were only 5 of us, not including the guide. This made it a more personal experience. The food was absolutely amazing, and we got to see lovely sights along the way! The guide was very knowledgable and kind. I would take this tour again if I ever go back! High recommend! The original Õstermalms Saluhall is still under renovation as of Feb. 20, 2018, so the food hall is in a temporary modern building next door. The display of food for sale was amazing! Samples provided there were good and included a small serving of beer. The Modern version of Swedish Meatballs elsewhere turned out to be made with Turkey - not what I expected, although at least the Turkey was from Sweden. The fish soup at one stop was excellent! Other foods sampled could be improved. Our guide was knowledgeable, and was very pleasant and helpful. She also pointed out historical points of interest as we walked by. Another great tour of stockholm and its food . Dunja was our guide again and this made the tour all the more enjoyable . she explain each of the foods we were eating and some had legends behind them which made the food even more interesting. each spot we stopped at had the food ready to taste and it was very good. we tasted food we would not get in our country so it was a great food tour. A point for people who are fussy eaters or have a intolerance should make this very clear at booking as you can see the people providing the food are small business owners so wasting anything they provide would be unkind. we love every bit of the food and was lovely and full by the time we finished. thank you again to Dunja for a great day. It was an amazing tour. The food was good and the guide made us eat really traditional food.